Rebecca is a 14 year old singer, dancer, actor and all round performer based in London, UK. Shes starred in many short films, written songs, and performed in a number of musicals and stage shows. We also produced all of the video content on the website, which is made up of 4 cover music videos, an original music video, and a dance video. We’re really happy with how these videos came out, check out some of the examples below! 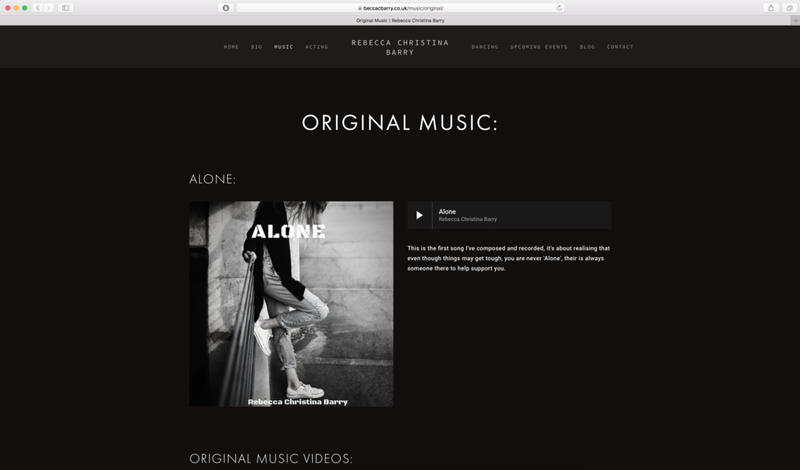 The videos were released at planned out times across Rebecca’s social media channels, as a way of getting traffic through to the website and building up hype to the release of her first original song and music video. The website is doing well, with a consistent amount of engagement and so are the videos on Rebecca’s YouTube! Rebecca and her mum were very happy with the finished products! Having worked with Bradley on a few projects now I can highly recommend his services. I wanted a bespoke website for my daughter Rebecca, who trains in performing arts industry. Bradley and I discussed my requirements and he guided me through the whole process and was on hand with a quick turnaround to answer any queries/suggestions I had.